Prepare 9-inch spring-form pan by wrapping outside of pan tightly with 3 layers of heavy-duty foil. Using paddle attachment on an electric mixer, beat cream cheese, sugar and flour until smooth. Add vanilla extract and salt. Slowly add heavy whipping cream until combined. Add eggs and egg yolks, one at a time, beating until incorporated after each addition. Stir in white chocolate and pour batter into prepared spring-form pan. Place pan into large roasting pan; add enough hot water to roasting pan to come halfway up sides of spring-form pan. For cranberry sauce, in a medium saucepan, combine the cranberries, water, sugar, lemon zest, and nutmeg. Bring to a boil then reduce heat to a simmer. Cook and stir until thickened, about 15 minutes. Remove from the heat; puree in a blender until smooth. Cool. For sour cream topping, in a small mixing bowl, mix together the sour cream, sugar, and vanilla extract until well incorporated. 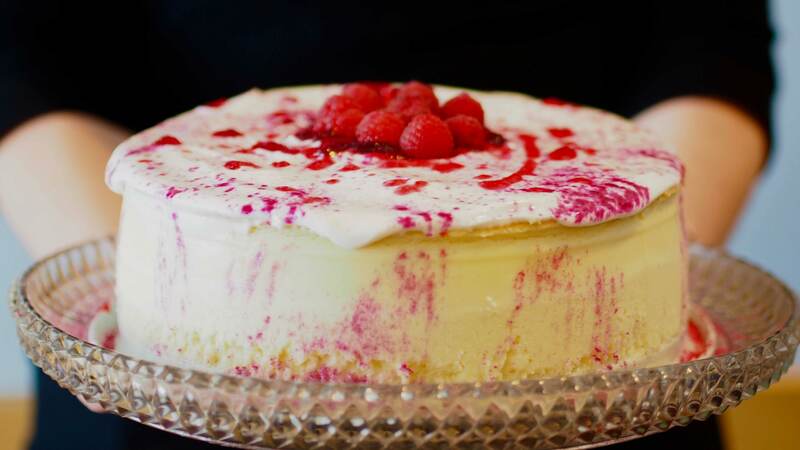 When ready to serve, plate cheesecake and top with sour cream topping, garnish with fresh raspberries, drizzle with cranberry sauce, and sprinkle with powdered pink sugar.